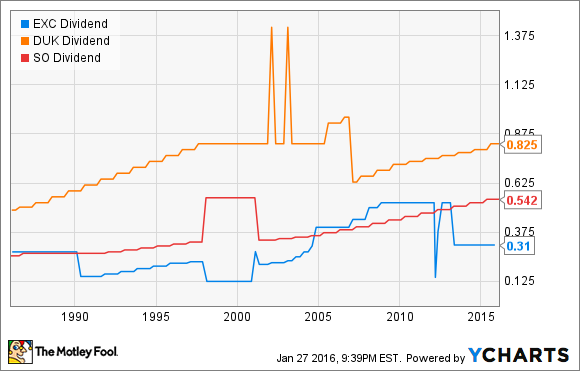 Will Exelon Raise Its Dividend in 2016? 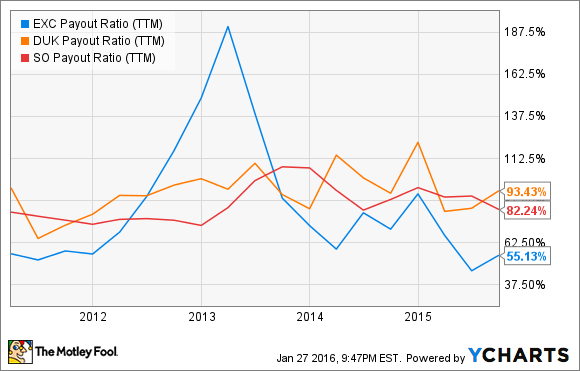 Will Exelon Corporation reward dividend investors this year? Exelon Corporation (NYSE:EXC) currently boasts a bragworthy 4.6% dividend yield. But bigger isn't always better, and investors need to know whether this dividend stock will distribute more than ever in the year ahead. Here are three of the most important indicators to know whether Exelon will raise its dividend in 2016. History is in the past, but that doesn't mean we can't learn from it. When it comes to dividends, corporations often tout their distribution track record. On Duke Energy Corporation's (NYSE: DUK) website, it notes that 2016 is the 90th consecutive year it's paid a quarterly cash dividend. On Southern Company's (NYSE: SO) site, it makes Duke's digits look dismal with a casual nod to the 273 consecutive quarters (since 1948) that it's paid a dividend. Exelon makes no such claims, and a closer look at the distributions of the three companies tells a revealing story. While Duke, Southern Company, and Exelon have all strived to build a "dividend staircase" of steadily increasing distributions, Exelon has been the most willing to shift courses. On four separate occasions, Exelon cut its dividend while Duke Corporation and Southern Corporation maintained (or even grew) their own distributions. Duke Corporation and Southern Company have had dips of their own, but neither corporation has pushed and pulled its distributions around as much as Exelon. While past precedent may tell us what a corporation wants to do, it doesn't tell us anything about its ability. Mountains of metrics attempt to decipher whether a corporation can afford to pay out a dividend. One of the simplest indicators is a company's "payout ratio," calculated as the percentage of earnings a company delivers as dividends. For Exelon, its current ratio stands at 55%, meaning $0.55 out of every dollar it earns goes straight back to investors. That's significantly lower than both Duke Energy Corporation and Southern Company and is on par with the average payout ratio for electric utilities. By this metric, at least, Exelon has plenty of profits to pay dividends. The most important hints of whether or not Exelon plans to raise its dividend come from the corporation, itself. In a recent Edison Electric Institute presentation, Exelon noted that its dividend "will be covered by the utilities, insulated from the earnings volatility of the generation business ." Getting into numbers, it promised to continue to deliver an annual $1.24 dividend, equivalent to what it's doled out for the past two years. Exelon also noted its dividend decisions aren't independent from the rest of its business. If it can make 10% or more return-on-equity (ROE) via regulated utility or power generation investments, it'll spend its money there. But "if investments do not meet [its] threshold, [Exelon] will return capital to shareholders " by retiring debt, repurchasing shares, or increasing its dividend. Exelon Corporation seems to be setting itself up for a steady year of dividend distributions. It may not raise its dividend, but it probably won't chop it, either. But there's more to a stock than its dividend , alone, and investors should keep a close eye on Exelon in the year ahead.